The picture has a fascinating history. It represents Emma listening to a sad story of Edward Gray's lost love Ellen Adair from Alfred Lord Tennyson's Edward Gray. and various studies are known to exist for the Moxon Tennyson, 1857, which was engraved by J. Thompson. Emma Moreland is the village girl who meets the eponymous protagonist walking on the road, and whose questions elicit an outpouring of grief about his ill-fated love for Ellen Adair. The attractive model for the painting was known only as Mrs B. 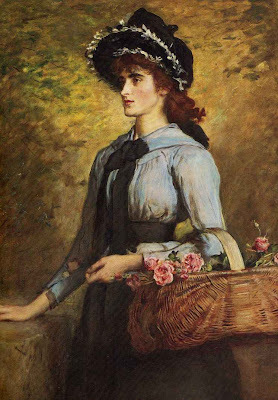 She turned up at Millais' studio c. 1886 and sat for him until one day she turned up with 'tears in her eyes' and said she could not sit again. She said she was the wife of a hump-backed professor of French, somewhat superior to herself in station, who had forbade her ever sitting as a model again. Millais put the painting away unfinished. Oddly in 1891, Charles Wertheimer spotting it in his studio heard the story from the artist and said he would have bought it if it had been finished. That very afternoon Millais had a letter from Mrs B. saying her husband had died and she was ready to sit for the artist again. The picture was finished but Millais kept it himself and it was sold at the artist's sale of 1897 just after his death in 1896. It was exhibited several times during his lifetime.